Trim It Up! Personalizing window treatments with decorative embellishments are all the rage. Trims with glass beads, shells or buttons can enhance window treatments presently in your home for a less expensive way to transform a room. Here is a beautiful master bath custom swag and cascade with elegant crystal beading and crystal accented tassels. Notice, we added the beading to the center swag and then on the side half swags. Elegance without over-powering the treatment. The crystal tassels at the cascades tie everything together perfectly! 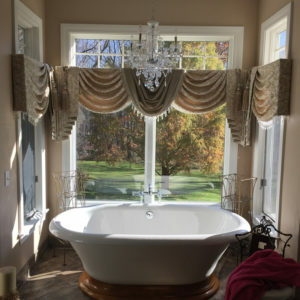 My client still raves and says she will just stand in her bathroom and take in the view! Kathleen loves having her clients overjoyed with their design experience and results! We can develop the perfect addition to your decor working with your vision and lifestyle, just give us call today to get started!